At the time, I was working nights and had to work Saturday mornings. Each night when I came home from work, my wife, Joan and I would pray for Mum. One night, we prayed for her and I commented that we had been asking God to do something for us--to heal Mum--but God has asked us to do something for Him and we were not doing it. Joan asked me what it was, so I read to her from the book of Malachi, where God talks about paying tithe and that He said He would rebuke the devourer for them that obeyed. 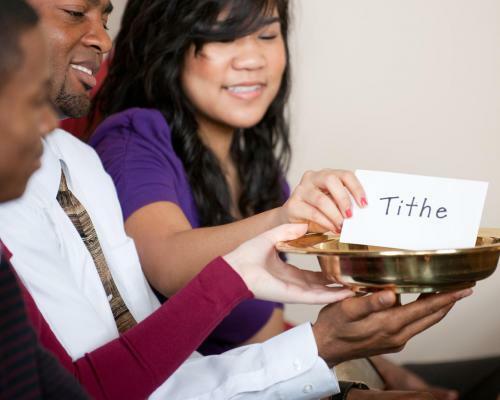 So Joan agreed we would pay tithe. At the time, we were living in humble financial circumstances but that night I went to sleep happier than I had been in a long time. However, the next morning I awoke to screams! Mum had been home from hospital for one week and her stitches had burst open. Fortunately, we had a neighbour who was a nursing sister. I ran for her and she immediately called the doctor, who arrived in minutes. The doctor said it was a rare thing for stitches a week old to burst but if they hadn't, Mum would have been dead in two hours. Immediately, I thought of the verse I had read the previous night, that God would rebuke the devourer. Mum amazed the medical people by living another 50 years. first two converts. Bring all the tithes into the storehouse so there will be enough food in my Temple. If you do," says the Lord Almighty, "I will open the windows of heaven for you. I will pour out a blessing so great you won't have enough room to take it in! Try it! Let me prove it to you! Malachi 3:10. Harry Gaughan went on to work as a painter for a number of years and lives in Albany, Western Australia.